Light up the night at all your parties and events! Plastic lanterns in fun luau-themed shapes are battery-operated with an on/off switch and have a plastic handle at the top. Use to cast a warm and inviting glow at events, luaus, beach parties... great for any Hawaiian Tahitian island style outdoor or indoor event. Also makes an adorable Pirate birthday party favor. Approx 5.5-inch (13.75cm) Tall. Requires 3- ‘’AAA’’ batteries, included FREE. 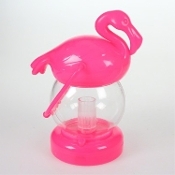 For tropical party atmosphere, a little gift favor for guests, or themed lighting for your home bar, this Flamingo Party Lantern glows brightly! Cute kitsch fun party lantern is vibrant pink and lit by a white LED to shine light from the goldfish bowl style center and lighting up the flamingo as it glows. Easy carry swivel handle to carry or hang around your home.